It can be easy to overlook sedans these days as crossovers are very much the dominant force in the current market, but that would be a shame as there are some fantastic sedans around at the moment, especially when it comes to midsize models. If you're not completely convinced, take a look at our 2017 Ford Fusion vs 2017 Hyundai Sonata comparison to see which one is the better car in this Ford vs Hyundai shootout, and find out a little more about what you might be missing. It's hard to think of a midsize sedan in the mass-market, or even the luxury segment, that's better-looking than the 2017 Ford Fusion. Its fastback roofline gives it a bit of a coupe look, and it also helps make the Fusion look pretty sporty for such a sensible and practical vehicle. It may have looked essentially the same for a few years now, but it's as attractive now as it's ever been. Hyundai ditched the excessive amounts of chrome the Sonata used to have a couple of years ago now with the last redesign. While that was a good move, the Sonata is now a pretty mundane design that won’t turn many heads, so this is an easy win for Ford in the first round of this Fusion vs Sonata head-to-head. 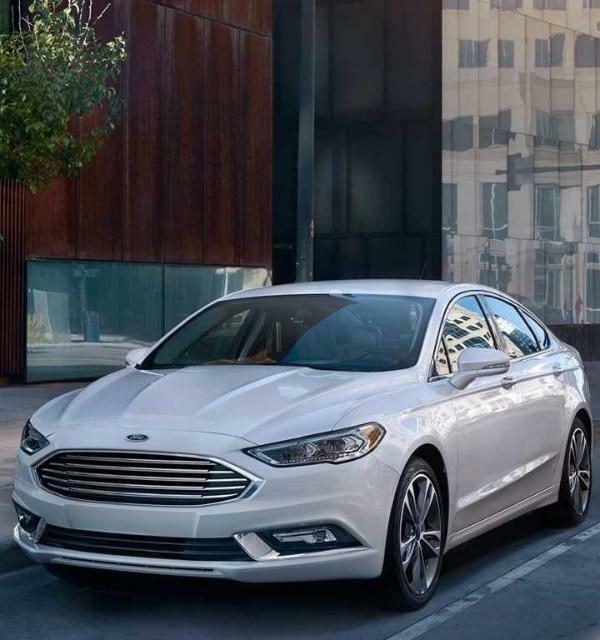 Few models in its class offer as much choice when it comes to engines as the Ford Fusion, with no less than four units for buyers to select from. The base engine is a 2.5-liter inline-four developing 175 horsepower and 175 lb.-ft. of torque, and the most powerful is a 2.7-liter EcoBoost V-6 with as much as 325 horsepower and 380 lb.-ft. of torque. Between those two there are two more EcoBoost engines of 1.5 and 2.0-liter displacements. The Sonata's base 2.4-liter inline-four produces a little more power than the Fusion's 2.5 with 185 horsepower and 178 lb.-ft., but the available 2.0-liter turbo's 245 horsepower and 260 lb.-ft. is well short of what the Ford has to offer. This has to be another easy win for the Fusion then. Fuel-economy isn’t perhaps the main focus of the Fusion, but it's certainly no gas-guzzler either, even in its V-6 form. The best EPA ratings come from 1.5 EcoBoost models with 23 mpg in the city, 34 mpg on the highway and 27 mpg combined. Most Sonata models you'll find on lots will have the 2.4-liter inline four, and it's a little better than the Ford with ratings of 25/36/29 mpg. But there's also been a 1.6-liter turbo-four since 2015 offering 28/36/31 mpg, so this is a strong victory for the Hyundai. The 2017 Ford Fusion checks all the boxes for a comfortable interior, and there really are no deal-breakers in the cabin. Despite that somewhat curvaceous exterior appearance and sloping rear roofline, it still has one of the more spacious interiors in its class. There are good seats and plenty of cargo space, but some of the interior trim is now starting to look a little past its best. Technically, the Sonata is defined as a large sedan by the EPA, but Hyundai is sensible in marketing it as a midsize. This means there's even more room inside than there is in the Fusion, and the overall style and quality just gives it the edge over its Ford rival. The 2017 Hyundai Sonata definitely puts up a good fight here, but it's still fighting a losing battle against the sensational 2017 Ford Fusion. There's more power, more choice, more fun and more style on offer with the Fusion, and the Sonata is just one of many rivals that still needs to try harder to overhaul the incredible Fusion. You can see the 2017 Ford Fusion right now at Southern California Ford Dealers, so get in touch today for more information and to arrange a test drive.